A21B-0142. Gross Fluxes of Methyl Chloride and Methyl Bromide in a California Oak-Savanna Woodland: Seasonality, Soil Moisture and a Smaller Sink. R. C. Rhew; C. Chen; Y. Teh; D. D. Baldocchi. B11D-0499. How do land management practices affect net ecosystem CO 2 exchange of an invasive plant infestation?. O. Sonnentag; M. Detto; B. Runkle; M. Kelly; D. D. Baldocchi. B31A-0319. On the correct estimation of effective leaf area index: does it reveal information on clumping effects?. D. D. Baldocchi; Y. Ryu; T. Nilson; H. Kobayashi; O. Sonnentag. B33F-08. FROM POINT TO GLOBE: UP-SCALING CARBON AND WATER FLUXES FROM FLUXNET EDDY COVARIANCE TOWER VIA INTEGRATION WITH GLOBAL EARTH OBSERVATION. M. Reichstein; M. Jung; C. Beer; E. Tomelleri; D. D. Baldocchi; N. Gobron; C. Roedenbeck; D. Papale. B51A-0293. Impact of Rice Grown on Surface Energy Balance in the Sacramento-San Joaquin Delta and the Sacramento Valley. F. Anderson; M. Detto; J. G. Verfaillie; D. D. Baldocchi; R. L. Snyder. 'eScience in the Cloud: A MODIS Satellite Data Reprojection and Reduction Pipeline in Windows Azure Platform'), with Youngryel Ryu as a collaborator, has been accepted to the 24th IEEE International Parallel & Distributed Processing Symposium. Rodrigo Vargas attended a North American Carbon Project workshop in Oak Ridge, TN. Ryu, Y., O. Sonnentag, T. Nilson, R. Vargas, H. Kobayashi, R. Wenk, and D.D. Baldocchi, How to quantify tree leaf area index in an open savanna ecosystem: A multi-instrument and multi-model approach, Agricultural and Forest Meteorology, 150 (1), 63-76, 2010. Ma, S., Concilio, A., Oakley, B., North, M. & Chen, J. Spatial variability in microclimate in a mixed-conifer forest before and after thinning and burning treatments. Forest Ecology and Management in press. ddb attended theInteragency Forestry Working Group Forest Inventory Symposium at the Air Resources Board in Sacramento and gave a talk on 1) Carbon cycle and 2) carbon fluxes of oak savanna and annual grasslands. Rodrigo Vargas attended a Fluxnet synthesis workshop in Maine and a North American Carbon Project workshop in Reston Virginia. Xiao, J, Zhuang, Q.,Law, B.E., Chen, J, Baldocchi, D.D., Cook, D.R., Oren, R., Richardson, A.D., Wharton, S., Ma, S., Martin, T.A., Verma, S.B., Suyker, A.E., Scott, R.L., Monson, R.K., Litvak, M., Hollinger, D.Y., Sun,G., Davis, K.J., Bolstad, P.V., Burns, S.P., Curtis, P.S., Drake, B.G., Falk, M., Fischer, M.L., Foster, D., Gu, L., Hadley, J.L., Katul, G.G., Matamala, R., McNulty, S., Meyers, T.P., Munger, J.W., Noormets, A., Oechel, W.C., Paw U, K.T., Schmid, H.P., Starr, G., Torn, M.S., Wofsy, S.C. 2009.. A Continuous Measure of Gross Primary Production for the Conterminous 1 U.S. Derived from MODIS and AmeriFlux Data. Remote Sensing of the Environment. Accepted. Ryu, Y., Nilson, T., Kobayashi, H., Sonnentag, O., Law, B.E. and Baldocchi, D.D., 2009. On the correct estimation of effective leaf area index: does it reveal information on clumping effects? Agricultural and Forest Meteorology, In review. Naama Raz-Yaseef joins the Biomet Lab as a postdoctoral scientist for 2 years. Dr. Raz-Yaseef has funding from US-Israel Binational Agricultural Research and Development Fund. She has expertise in Ecohydrology and comes from Dan Yakir's lab at the Weizmann Institute. Vargas R, Baldocchi DD, Bahn M, Hanson P, Kulmala L, Pumpanen J, Yiang B. A multiscale analysis of the influence of GPP on soil CO2 efflux: a wavelet coherence approach. International Carbon Dioxide Conference (ICDC). September 13-19, 2009. Jena, Germany. Vargas R. Understanding CO2 efflux and production: do we need to look deeper into the soil? ESF LESC Exploratory Workshop: Diurnal to century scale controls on soil respiratory fluxes. Towards a new generation of integrated experimental and modeling approaches. September 21-23, 2009. Innsbruck, Austria. Ryu, Youngryel, Oliver Sonnentag, Tiit Nilson, Rodrigo Vargas, Hideki Kobayashi, Rebecca Wenk, and Dennis D. Baldocchi. How to quantify tree leaf area index in an open savanna ecosystem: A multi-instrument and multi-model approach. Agricultural and Forest Meteorology In Press. Rodrigo Vargas was recognized as National Researcher Level 1 (out of 3 being 3 the highest category) from the CONACyT (it is the NSF of Mexico). Rodrigo Vargas attended an LTER workshop in New Mexico. Gu, L., Post, W.M., Baldocchi, D.D. Black, T.A. Suyker, A.E. Verma, S.B. Vesala, T., Wofsy, S.C. 2009. In: Phenology of Ecosystem Processes. Asko Noormets, Editor. Springer. Pg 35-58. Vargas, R., Baldocchi, D.D., Querejeta, J.I.,Curtis, P.S., Hasselquist, N.J., Janssens, I.A, Allen, M.F., Montagnani, L. 2009. Ecosystem CO 2 fluxes of arbuscular and ectomycorrhizal dominated vegetation types are differentially influenced by precipitation and temperature. New Phytologist, in press. Hollinger, D.Y. , S.V. Ollinger, A.D. Richardson, T.P. Meyers, D.B. Dail, M.E. Martin, N.A. Scott, T.J. Arkebauer, D.D. Baldocchi, K. Clark, P.S. Curtis, K. Davis, A. Desai, D. Dragoni, M.L. Goulden, L. Gu, G.G. Katul, S. Pallardy, K.T. Paw U, H. Schmid, P.C. Stoy, A.E. Suyker, and S.B. Verma. 2009. Albedo estimates for land surface models and support for a new paradigm based on foliage nitrogen concentration. Global Change Biology. In press. Doug Fox and Evan Variano visited the methane flux sites on Twitchell and Sherman Island. ddb participated on a panel discussion on 'From Farms to Forests: Carbon Implicatin of Land Use' at the 2009 Microsoft Faculty Summit. Matteo Detto attended a workshop at the University of Michigan Biological Station, Pellston, MI. 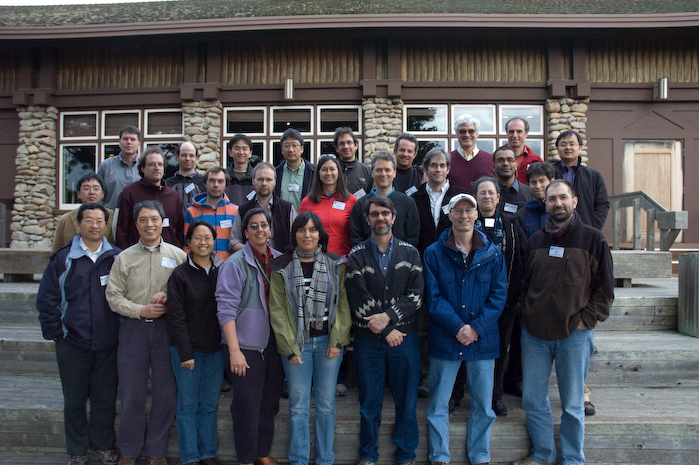 Youngryel Ryu attended the 4th Global Vegetation Workshop in Missoula Montana. ddb lectured at the 2009 Summer School on Land-Atmosphere Interactions and Climate Change at the Nanjing Institute of Science and Technology. He also visited the Institute for Geographical Science and Natural Resource Research, of the Chinese Academey of Science in Beijing. Beer, C., P. Ciais, M. Reichstein, D. Baldocchi, B. E. Law, D. Papale, J.-F. Soussana, C. Ammann, N. Buchmann, D. Frank, D. Gianelle, I. A. Janssens, A. Knohl, B. K? ?stner, E. Moors, O. Roupsard, H. Verbeeck, T. Vesala, C. A. Williams, and G. Wohlfahrt. 2009. Temporal and among-site variability of inherent water use efficiency at the ecosystem level. Global Biogeochem. Cycles 23.
ddb gave a presentation on Carbon and water exchange of California rangelands: an oak savanna, annual grassland and peatland pasture . Cal-Pac Society for Range Management. Santa Rosa, CA. May 14, 2009. Three students in the Biomet Lab are finishing their Ph.D.s and are graduating this spring. They include Xingyuan Chen, Gretchen Miller, and Ben Runkle. Gretchen as been offered a position as an assistant professor of civil engineering at Texas AM. Congratulations to all. Prof. Josep Penuelas from Barcelona visited the Biomet Lab for 3 weeks in May. We discussed topics ranging from phenology, biosphere-atmosphere interactions, VOC emissions and ecosystem ecology. Dennis Baldocchi was appointed Editor in Chief of Journal of Geophysical Research, Biogeosciences. The journal. JGR-Biogeosciences focuses on biogeosciences of the Earth system in the past, present, and future and the extension of this research to planetary studies. The emerging field of biogeosciences spans the intellectual interface between biology and the geosciences and attempts to understand the functions of the Earth system across multiple spatial and temporal scales. Specific topics within the scope of the section include process-based theoretical, experimental, and field studies of biogeochemistry, biogeophysics, atmosphere-, land-, and ocean-ecosystem interactions, biomineralization, life in extreme environments, astrobiology, microbial processes, geomicrobiology, and evolutionary geobiology. If you are developing original papers on process-oriented topics please consider submitting it to JGR Biogeosciences as your first choice. Baldocchi, D.D. Chen, Q., Chen, X., Ma, S., Miller, G., Ryu, Y., Xiao, J., Wenk, R. and Battles, J. 2009 The Dynamics of Energy, Water and Carbon Fluxes in a Blue Oak (Quercus douglasii) Savanna in California, USA, In: Ecosystem Function in Global Savannas: Measurement and Modeling at Landscape to Global Scales – edited by Michael J. Hill and Niall P. Hanan and published by CRC/Taylor and Francis. Submitted. Dennis Baldocchi.Physics Wins, Biology is How its Done. Centennial Speaker Series, Department of Land, Air and Water Resources, UC Davis. Jan 21.
ddb attended the NCEAS workshop on Linking carbon storage in terrestrial ecosystems with other climate forcing agents. Santa Barbara, Jan 27-29. Sebastiaan Luyssaert from University of Antwerp is visiting the Biomet lab for a month as a FLUXNET visiting scientist. He is working on the role of extreme climate conditions on carbon fluxes.